I think the ‘request access’ idea is great. BTW I’ve discovered that I can embed non google gadgets using the google gadget plug-in. I’m using a recording facility this way which is great as mine is a language learning wiki. My students don’t want to know every time I change something on the wiki and several of them were bored by all the notifications they were getting automatically. Could you make “request notifications” an optional extra when they sign up. I’ve disabled it as standard but some people were still getting them. I guess they didn’t understand what notifications meant when they signed up for them. I have 2 wikis, one is the newer format. I said I would beta test but I don’t know which I should do it with. The newer one? This is a great service and the help is terrific when you have a problem. 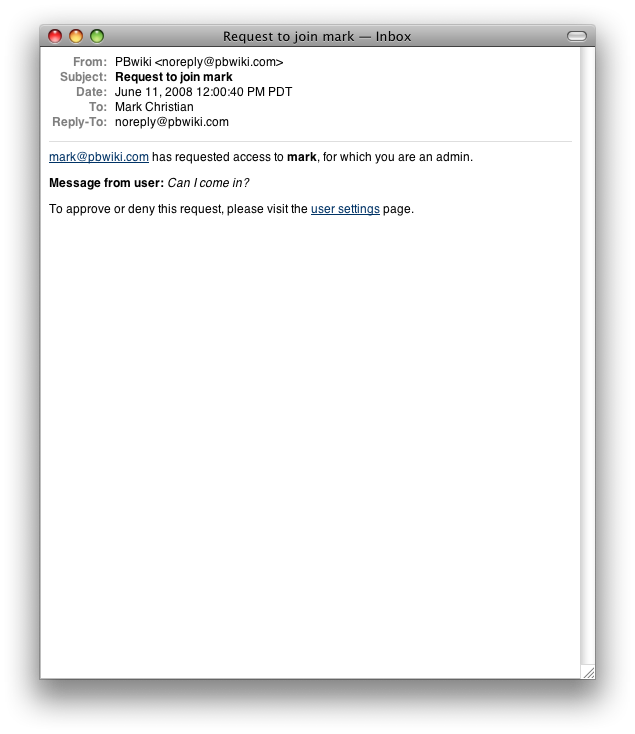 This is an improvement over the existing system that doesn’t allow for uploading a roster of participants’ emails from a spreadsheet or database. It’s a compromise, but still not as desirable as being able to send the link to participants and let them have access. I’m afraid that the requirement to stop and create a profile, username, password etc will be a barrier to some who otherwise would participate. Thanks for developing this alternative, though. great! There’s a wiki that i found a while back that I wanted to add myself to by couldn’t figure out how. They seemed to be encouraging visitors to log in and contribute, but they must have forgotten to put their password on the wiki. When users request access, the administrator does not have the option of making them a “reader”. It only gives the administrator, editor or writer options. Why isn’t “reader” an access option with the new “request access” feature? After a whole semester of using pbwiki, some of my esl students still have trouble logging on. I know I should have made my url much smaller – so they didn’t end up making typing errors, but there’s always been confusion for them over logging in – two different areas on the same page to choose from. Moreover, in class, if they use a different computer, all the email details of the previous student come up. Much as I like using this wiki – the password/log on requirements (especially if it’s private) are very onerous and discouraging for ESL students and those with minimal computer skills. Concerning the email details, it’s a good lesson to make sure everyone logs out of their accounts, since that’s a security precaution that makes sense across the Internet. As for the login issues, I agree, it’s traditionally been a problem. 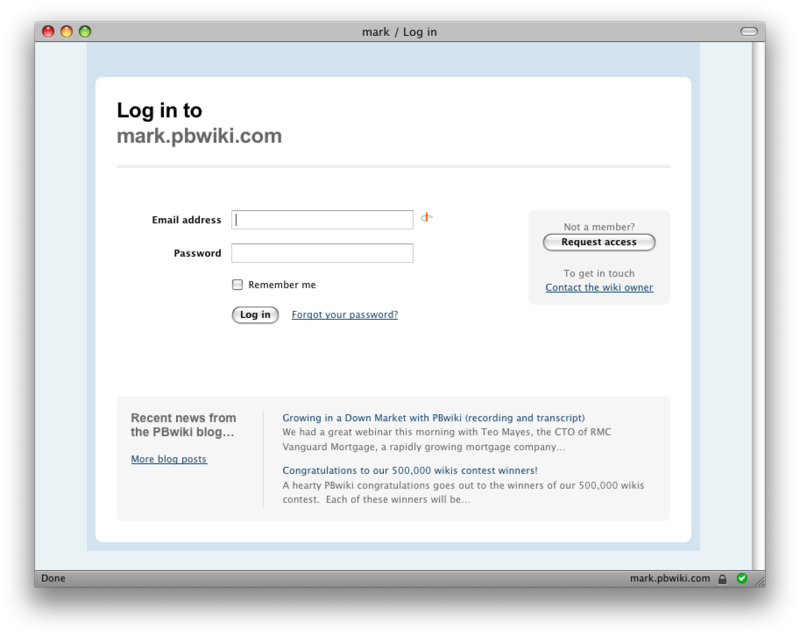 If users have email accounts, switching to PBwiki 2.0 makes a lot of sense, but if you are still using Invite Keys, we have to keep this old form. 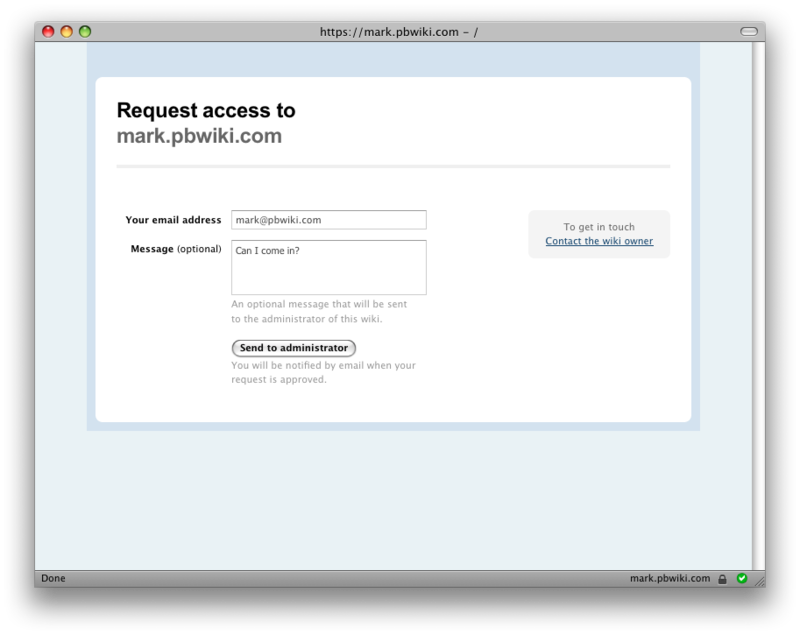 PBwiki is working on ways for people without email addresses to log into 2.0, and I think that will alleviate many of these issues. Please email us at support[at]pbwiki[dot]com if you have further questions or comments. I would certainly welcome an option that does not require email addresses. It was very challenging setting up classes on the wiki when we used 2.0. The wiki experience generally has been very good, but the login was a very frustrating piece, especially when you are dealing with 90 students or more. I would like to stick with PBwiki for September, but would really appreciate a change in the login before that time if possible. This is great news! I think I will be mass-uploading most of my students to set up accounts, but this means I can quickly and easily walk new students through the process when they join us part-way into the year. We have e-mail addresses, so we’re set there. Thanks for listening to your audience and incorporating features your users desire. I love this request access feature! I will have 165 to 180 7th grade language arts students this year, and I was beginning to wonder about giving up the class time (or my personal time) to enter all of their e-mail addresses. Thanks so much, from a busy educator, for making my like so much easier!! I have had a couple of requests to join. However, even after I click on “approve,” the request is still there. I clicked approve several times, so I might be hitting the requester with a barrage of emails. In the end, I ended up having to add the email manually. PLEASE, PLEASE, bring back the invite key. If I’m not connected when someone requests access, they have to wait to contribute. By then, they have moved on. With the invite key, I can tell the group I’m working with, students or workshop attendees, a keyword that they can remember or write down. If they have that word than they have access when they want it rather than waiting for a response from me. I have yet to see complaints about the invite key so why did you remove it??? Hi Lauren, we decided to move away from invite keys because they made it difficult to remove users and could cause vandalism if the invite key was shared or misplaced. I’m sorry I don’t have a better solution for you. Right now I’m working on creating a World directory that anyone can edit. Is there any development on something that can remove the administrator’s requirement to accept access each time? I realize that might seem like a poor idea but we want it so if people have information to add it will be easy for them to right at the moment Instead of having to wait for permissions.